The success of development projects is strongly impacted by the project teams' familiarity with best practices in project management and procurement. However, in most parts of the developing world, and in Africa in particular, the management of development projects is entrusted to public servants or national consultants that have not had sufficient exposure to such best practices. This situation hinders the proper execution of projects, leading to sub-standard quality of achievements on the ground and insufficient benefit to the targeted populations. Practical experience of development work shows that more reference tools are needed in order to facilitate and increase the efficiency of these professionals' work. This book was written as a tool for international development institutions, who will find it useful as a reference for the staff of the projects they finance and for their own staff as well. 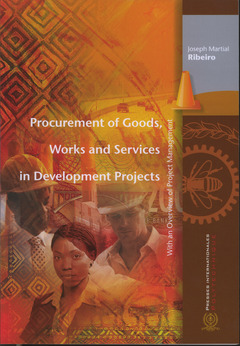 Students in the areas of project management, procurement, engineering, business administration, law and accounting that are interested in development project work will find it a handy practical guide.